Set up a workspace where you can spread out and get down to business with the Napa L-shape desk. 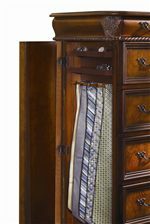 Beautiful classic design is at play on this desk with the ash burl panel detailing, grape leaf wood carving accents, rope moulded case borders and warm cherry finish. A built-in power director, USB power hub, grommet holes with caps, convertible keyboard storage / pencil drawer, easy access to the back of a CPU, felt lined top drawers and a file drawer that holds both letter- and legal-size files are the attributes that make this desk indispensable. 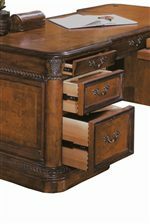 Tackle daily tasks in old world style with this L-shape desk from the Napa collection. 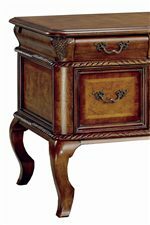 The Napa Traditional L-Shape Desk & Return with Ash Burl and Rope Moulding Details by Aspenhome from Bullard Furniture. 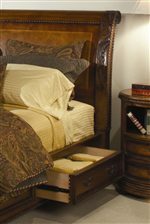 We proudly serve the Fayetteville, NC area. Product availability may vary. Contact us for the most current availability on this product. I74-305 Computer Desk for a Return 1 72" 37" 30"
I74-306 Return Desk 1 49" 27" 30"
The Napa collection is a great option if you are looking for Traditional furniture in the Fayetteville, NC area.